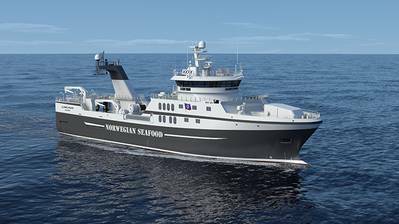 Rolls-Royce said it has signed a contract to deliver ship design and a range of equipment to a 70-meter long stern trawler to be built for Olympic Seafood based in Fosnavåg, Norway. The fishing vessel is to be built by Cemre shipyard in Turkey, who also holds a contracted option for a second vessel of the same type for Olympic Seafood. 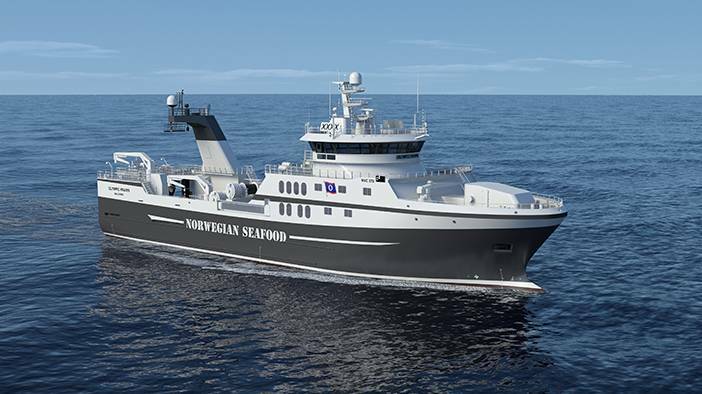 The vessel is designed for bottom trawling as well as pelagic trawling and will have a modern factory deck arrangement to handle and freeze both white fish and shrimp and ensure a high quality catch. The vessel is expected to be delivered in 2020. The vessel will be of type NVC 370 with a low resistant hull design, which meets increased demands for fuel efficiency combined with good sea keeping, Rolls-Royce said. “We’ve designed a highly efficient trawler that will be equipped with a package of power and propulsion, electrical and automation systems that will deliver benefits to both the owner and the environment, as well as safety and good working conditions for the crew,” said Monrad Hide, Rolls-Royce, Vice President Sales. The equipment to be delivered from Rolls-Royce includes the B33:45 diesel engine. A hybrid propulsion system can deliver both mechanical and diesel-electric drive of the Promas integrated rudder and propeller system. The Hybrid Shaft Generator (HSG) ensure optimum propeller and engine efficiency by running both at their most efficient point. Rolls-Royce will also deliver its latest deck winches, driven by a permanent magnet electric motor, to Olympic’s new vessel.